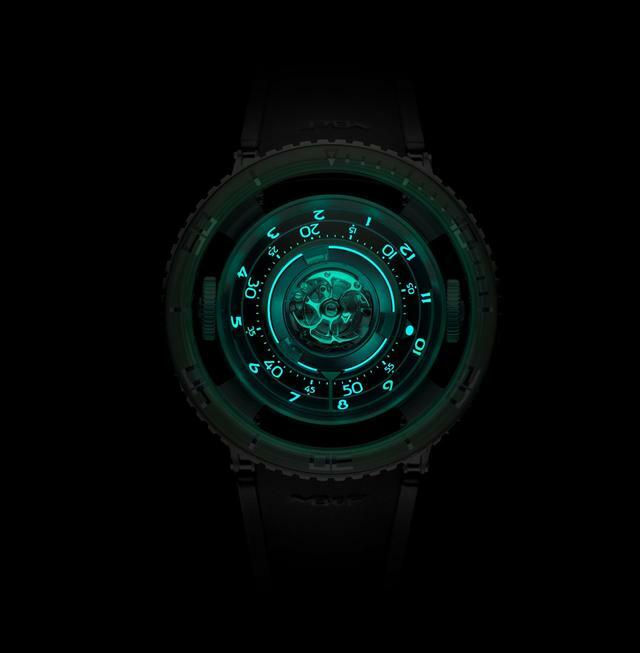 When MB&F introduced its HM7 Aquapod at last year’s SIHH, the mechanical jellyfish for the wrist quickly became one of the show’s most-discussed timepieces. 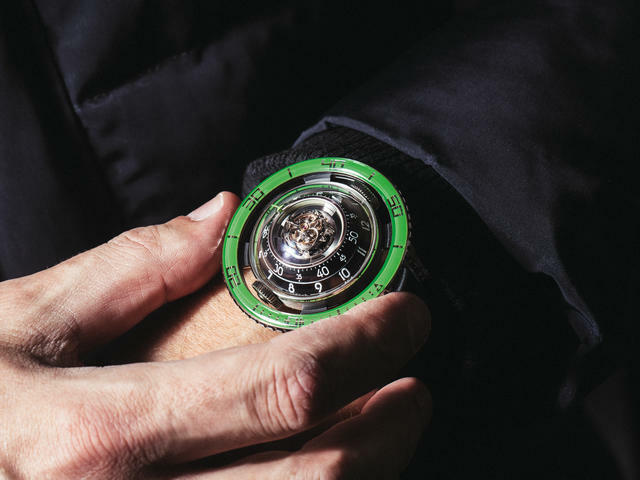 The 53.5mm x 20mm watch with centrally mounted flying tourbillon, especially the lighter, titanium-cased version, turned out to be surprisingly comfortable on wrist despite its large size. The HM7’s organic shape and extra-bright blue luminescence effectively mimicked its muse, the jellyfish, many of which also glow in the dark. The HM7 sits on the wrist not unlike how a jellyfish floats in the ocean. 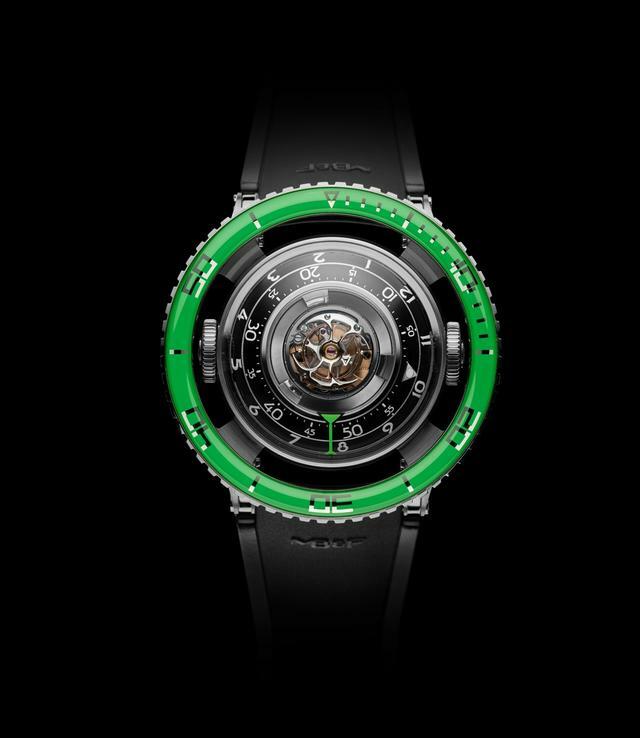 After that initial debut of two editions, one with a red gold case and a black bezel and a titanium version with its blue bezel, MB&F today adds a second titanium edition, this time displaying a green bezel and green luminescence and available in a limited edition of fifty pieces. 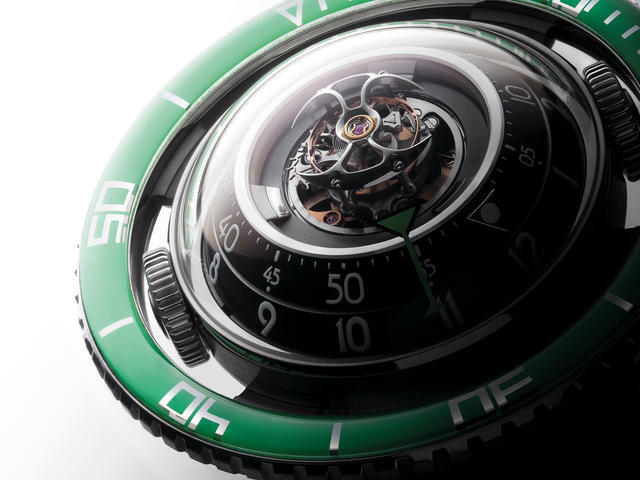 You’ll recall that the HM7 Aquapod features a vertically arranged movement with, from bottom to top, the winding rotor, mainspring barrel, hour and minute indications, and flying 60-second tourbillon, all concentrically mounted around the central axis. Hours and minutes are displayed by two spherical segment discs in aluminum and titanium, which are supported by specially developed oversized ceramic ball bearings. Despite its size, the 53.5mm x 20mm HM7 Aquapod, with centrally mounted flying tourbillon, is surprisingly comfortable on the wrist. While the clever vertical arrangement allows MB&F to again create a biomorphic-inspired wristwatch, the round layers here are not simply an aesthetic construction. These layers actually define how the HM7 transfers its power from wrist to hands. 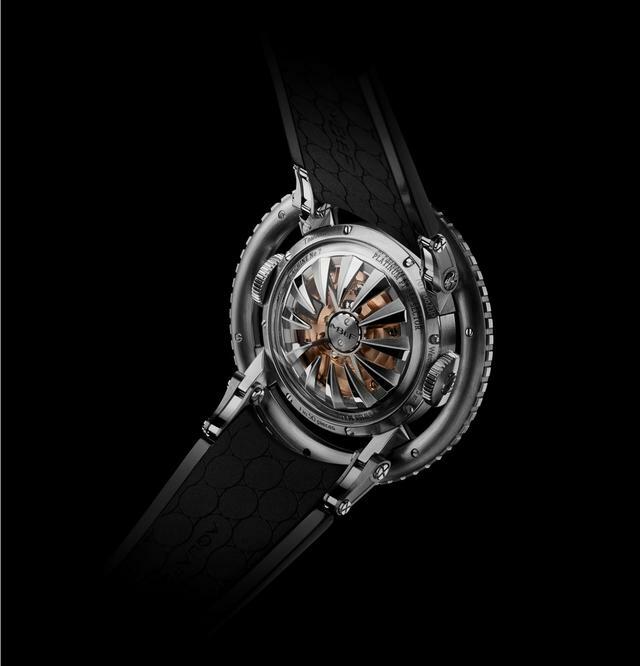 As MB&F explains, energy travels from the titanium/platinum rotor at the very bottom of the movement to the flying tourbillon regulator at the very top via gearing acting like a series of stairs, allowing power to transition from one level to the next. 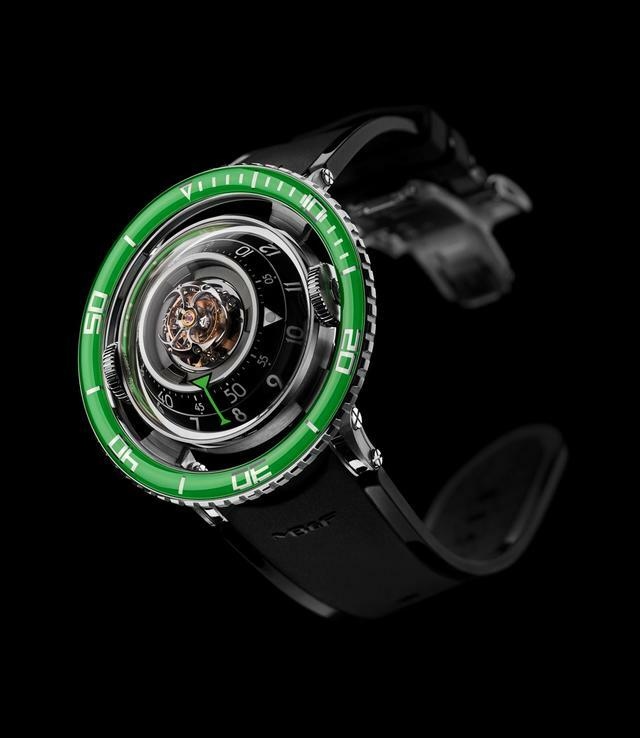 The MB&F HM7 is now available with green luminescence. 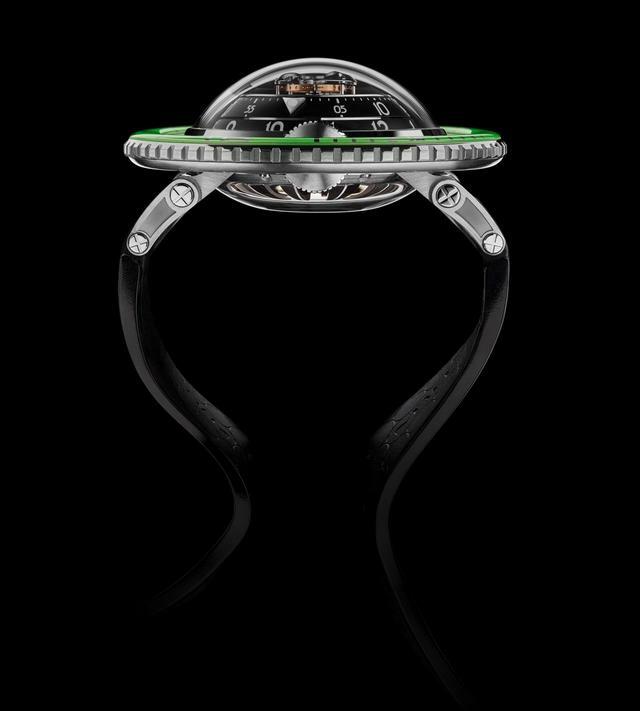 Another unusual construction feature of the Aquapod can be seen in the unidirectional rotating bezel: it is not attached directly to the case and instead ‘floats’ just outside it. Also unusual are the dual crowns. When needed, the one on the left winds the movement and the crown on the right will set the time. If you plan to do either operation with wet hands, the large-size of both crowns will make either operation simpler. 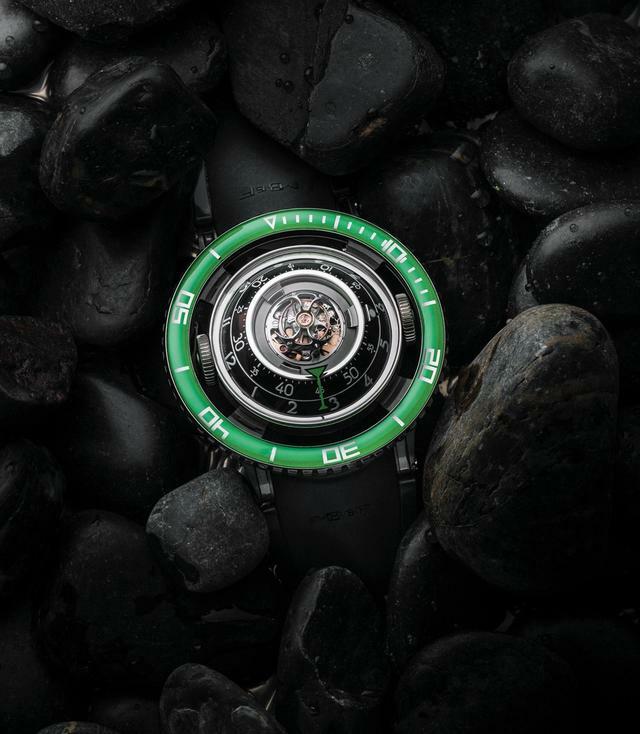 You’ll need 108,000 green U.S. dollars to pick up one of the fifty newly green MB&F HM7 Aquapods. 53.8 mm x 21.3 mm grade 5 titanium, water resistance 50 meters, sapphire crystals bottom and top. Rubber bracelet moulded in aircraft-grade Fluorocarbon FKM 70 Shore A elastomer with folding buckle matching case material.